W Seoul-Walkerhill, the world's foremost "style" hotel brand of Starwood Hotels & Resorts Inc, undisputedly one of Seoul's trendiest venues, introduces attractive and unique Chef Promotion by series. The promotions took place every two months, each of them lasting for a week; it will feature world's prominent chefs, along with their food, culture, and style. This event will break the cycle of traditional chef promotions, where chefs introduce dishes from famous restaurants. Instead, cooking classes, open dinner shows, and parties will be arranged in order to provide opportunities to fully experience celebrity restaurants' style and trend. The 2006 rising-star chef, Zackery Pelaccio from Fatty Crab & 5 Ninth Restaurants in New York City, beloved by New Yorkers, is in town to share his secret recipes & favorite personal cooking tips through an exclusive cooking class at Namu in November 2006 as a first event. W Seoul was proud to present the second volume of celebrity chef's featuring Chef Michael Reidt from Sevilla Restaurant in Santa Barbara. Sevilla was named "Best Restaurant of 2005" by Esquire Magazine. Get to know him, learn to spice up your meals, experience cooking from the best. Also Kevin Lee Collection has been invited to present top-notch table setting and offer party decoration ideas. Celebrity Chef Promotion Vol.1 and Vol.2 has been a success and the new volume will make people look forward to the new upcoming chef's dishes. The third promotion's chef, Michelle Bernstein, is the main chef at Mimi's Restaurant, Michy's. 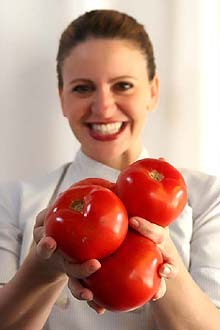 Starchefs.com, the "Rising Star" award winner, Michelle Bernstein, will soon arrive in Korea. Michelle Bernstein uses Latin based dishes and casual American Florida style. New York Times and Bon Appetit awarded her with the "50 Best dishes in the World." From the program Iron Chef America, she won over the most popular Chef Bobby Flay and won popularity. Many Koreans have viewed the Iron Chef program and is aware of the shows popularity. She started out being a ballerina but quit that path to be a Chef. As she decided to become a chef she already had knowledge on well-being and aliment therapy culture. On 28th March, she is in town to share her secret recipes & favorite personal cooking tips through an exclusive one on one cooking class at Studio Kitchen. 100,000KRW ~120,000KRW tax and service included. Last day, Sunday, Latin dishes will be used as a base and a special brunch will be introduced. You will be able to taste Miami Food and Latin flavour with passion and experience. Let's wait and see what she can do. Experience the freshest ingredients as you please your taste buds with a Miami flavour. This is one tasting your taste buds can not miss.